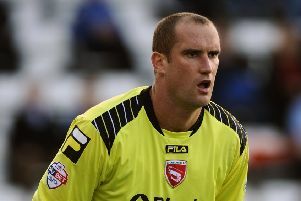 Ten-man Morecambe’s search for a League 2 win goes on after a late collapse at Bristol Rovers on Saturday. Jamie Devitt’s penalty after 12 minutes had put The Shrimps in pole position for a first victory in seven games. But things unravelled spectacularly in 12 second-half minutes. First Rory Gaffney levelled things up on 68 minutes after Barry Roche’s weak punch before Billy Bodin’s header completed the comeback 10 minutes later. Andy Fleming was then sent off 10 minutes from time for petulantly pulling back the hair of Stuart Sinclair to complete another miserable afternoon for The Shrimps. It all means Jim Bentley’s side have picked up just one point from the last 21 available. As both sides struggled to adapt to the horrible conditions at the Memorial Stadium Morecambe took the lead out of nowhere 12 minutes in. Ryan Edwards rose to meet Devitt’s corner with his header being blocked by the arm of Tom Parkes. Despite the two misses at Mansfield Shrimps fans didn’t need to worry as Devitt made no mistake in front of the baying home fans, firing high past Steve Mildenhall. After a shaky start for the hosts, with misplaced passes a feature of their play, Rovers began to find their feet as the half progressed. But free-flowing football from either side was at a premium as both managers made changes, Darrell Clarke changing shape and Bentley having to replace the injured Adam Dugdale as his depleted squad suffered another blow. If anything the conditions worsened as the half went on with the howling wind making clearances and crosses a lottery. Bodin did fire one shot over from distance with Alan Goodall also heading a Chris Lines corner narrowly wide of his own goal but meaningful attempts were a rare sight. It was the hosts who were in the ascendancy at the start of the second period but Morecambe had the best of the openings. First Mildenhall needed a full stretch save to keep out Kevin Ellison’s 25-yard shot before Paul Mullin brought a low save from the Rovers stopper. Despite Rovers continuing to enjoy more of the territory, The Shrimps looking increasingly dangerous on the break, Ellison denied by one fine Parkes challenge. It was Rovers however who got the game’s next goal on 68 minutes. Daniel Leadbitter’s high cross was only half-punched clear by Roche in the swirling wind with Gaffney firing home the equaliser from 12 yards. The home side sensed a quick turnaround, Liam Lawrence shooting narrowly over the bar a minute later. Rovers didn’t have to wait long for the second goal however which came on 77 minutes. As Rovers appealed for a penalty Lee Brown sent over a high, hanging cross which Bodin headed home at the back post to complete Rovers’ comeback. Things went from bad to worse for The Shrimps 10 minutes from time as Fleming saw red for a pulling back the hair of Sinclair, the pair having been in close quarters throughout the afternoon. The Shrimps pushed for a leveller, but the closest they came was Mildenhall saving from Alex Kenyon in stoppage time. Bristol Rovers: Mildenhall, Leadbitter, Lockyer (capt), Parkes, Brown, Lines (O Clarke 90), Lawrence, Sinclair, J Clarke (Bodin 31), Taylor (Easter 78), Gaffney. Subs not used: Puddy, McChrystal, Montano, Fallon. Morecambe: Roche, Edwards, Dugdale (Kenyon 35), Parrish, Barkhuizen, Fleming, Goodall, Beeley (capt), Devitt (Wildig 75), Ellison, Mullin (Wilson 66). Subs not used: O'Hara, Bondswell, Hedley.